Devil's Claw Root is a traditional and trusted natural extract commonly used with great success in the place of chemical-based prescription medicines. Extensively used to reduce winter stiffness and promote mobility, flexibility and suppleness, Wendals Liquid Devil's Claw Root is of particular benefit to the veteran or hard-working horse. Water, Ethyl Alcohol, Devil's Claw Extract (20% infusion). 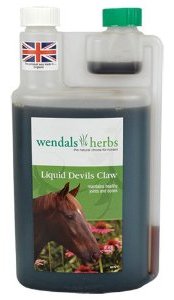 There are currently no questions for Wendals Liquid Devils Claw Joint Care for Horses - be the first to ask one!